In the words of my musical hero Brian Wilson, “I guess I just wasn’t made for these times”. This sentiment resonates with me always, but sometimes, when I feel like the only sane person in a mad world (or is that the other way round?) the call of the hills is too strong to resist. Take this weekend for instance. A bitter dispute with my beloved propelled my stress levels into the stratosphere and, on a whim I jumped in the car and headed for my spiritual home, Eryri. There I would surely find some piece of mind, but not on the spectacular peaks of northern Snowdonia which would be crawling with happy, talkative folk eager to pass the time of day. No, I needed to go to a place where I could avoid human contact and commune with my inner misanthrope. With this in mind I made my way to the Arenig mountains, solitary lumps set in a remote semi-wilderness far from the madding crowds. 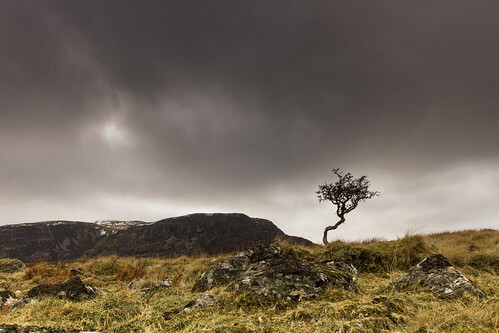 It was early afternoon by the time I turned off the main Bala to Trawsfynydd road and soon I was on a narrow ribbon of tarmac, heading into wild mountain country, a lonely land over which the cloud hung low. Ahead was the sprawling mass of Arenig Fawr which I would climb on the morrow, but at that moment I had a longing to walk into the landscape, to be part of it and reacquaint myself with some much needed perspective. I took a pathless route across bleak moorland onto Fridd Felen and found a stunted hawthorn which I photographed at length. Around these parts and off the beaten track it is difficult walking country and the thought of traversing it in the pre-dawn was unpalatable to say the least, but I knew I had to return to that old tree the very next day and so, that’s what I did. ~ by nicklivesey on February 19, 2013. 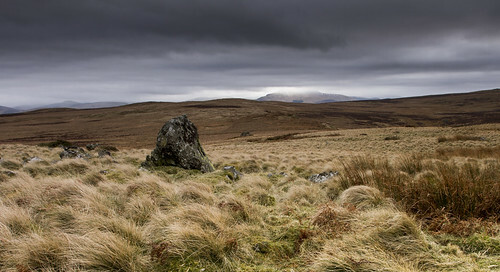 Nick, superb photos as usual, it was nice to meet you up on Arenig Fawr on Sunday morning. Hope you enjoyed the rest of your day. It really is a great area.